To help simplify your financial life so you can spend more time doing the things you enjoy and that matter most to you. You’ve worked hard to earn your success, and you deserve to work with an advisory team that will work just as hard on your behalf to help you grow, protect and preserve the wealth you have built.Customized SolutionsAt The McCormick Group at Morgan Stanley, we have been helping people like you address the many challenges that come with wealth, from investment and risk management to business succession and legacy planning. For more than 20 years, we have focused on a personalized approach to investing and planning that helps connect the dots between where you are today and where you want to go. We combine our many years of experience with a thorough understanding of the unique complexities of your situation to create customized strategies and solutions that help you achieve your lifestyle goals.A Culture of ExcellenceOur practice is built on three core values: integrity, objectivity and accountability. These values are the cornerstone of a strong advisory relationship that always puts your best interests first.We look forward to learning more about you and your family, and discussing how we can help you pursue what is most important to you. With more than 50 years* of combined experience in the financial services industry, we help our clients stay focused on what’s important to them and their families, through market cycles and throughout every stage of their lives. In addition to helping you develop and implement a customized wealth management strategy, we help you maintain the discipline and patience required to stay on track with your plan that we have put in place together. 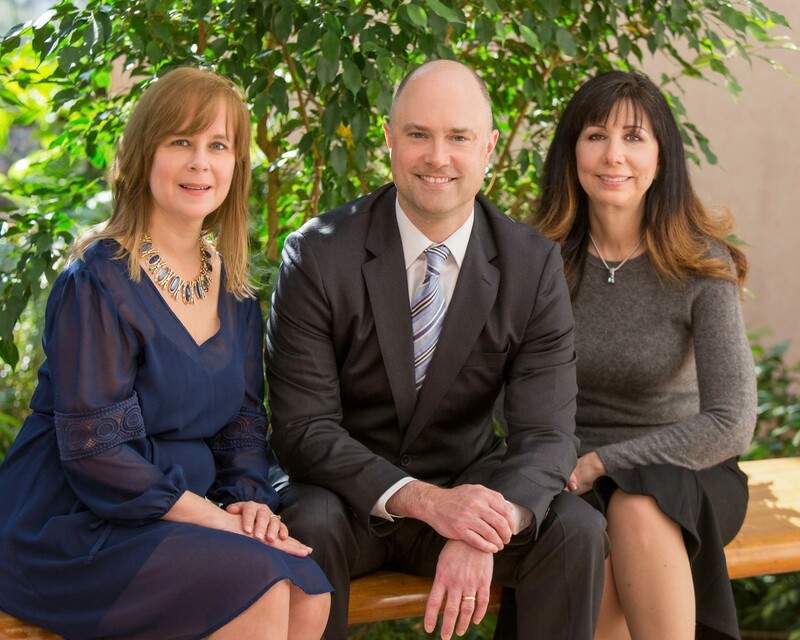 We consider ourselves a part of your team, and we work closely with your other professional advisors to help ensure that the financial, tax and legal aspects of your wealth management strategy are coordinated and customized to your financial and lifestyle goals. Our personalized investing and planning process is designed to help you chart a clear course toward realizing your financial and lifestyle goals. We invest significant time in getting to know you—your needs, your concerns and your vision of the future. By doing so, we can develop strategies that are customized to your goals and help to set realistic expectations about what you can hope to achieve and when. Our goal is to help you feel more confident that the lifestyle and legacy you envision is in reach. Wealth is a private, personal topic that affects nearly every aspect of your life, so your relationship with us is not just a financial one, but also an emotional one. You are the center of everything we do. From our first meeting to our annual updates, and everything in between, we strive to offer you the highest level of service and the confidence that comes from working with experienced professionals. We also encourage your family members, whether it’s your spouse or your children, to engage in the process. We work with successful individuals and families who recognize the need for personalized wealth management solutions that are tailored to their specific goals and aspirations. While each of our clients has a unique story, many of them share the same concerns—being able to retire comfortably, having greater clarity into their finances and feeling more confident about their financial futures. Our clients understand and appreciate the value of professional advice, and they trust us to make their best interests our top priority. We value the strong relationships we have formed and maintained through both good and difficult economies, and that have continued across generations. 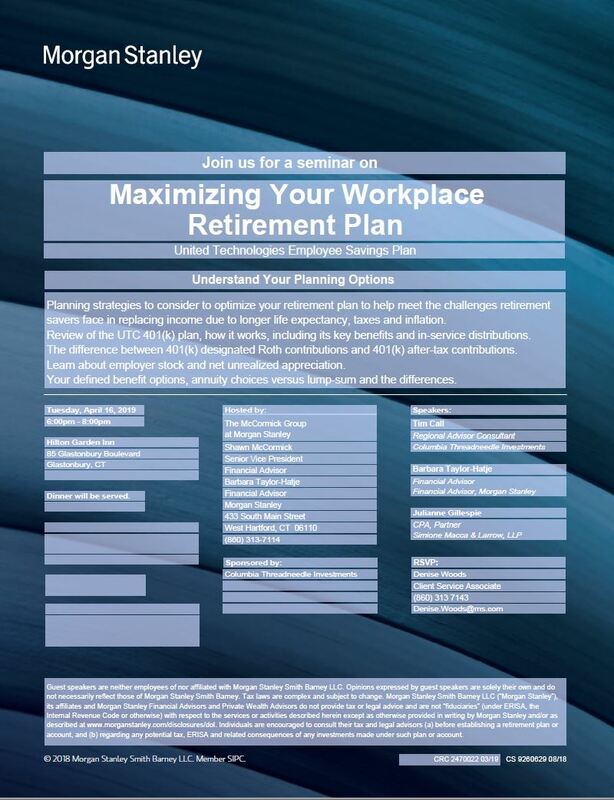 Please join us at this informative event for UTC employees. For more than 21 years, Shawn McCormick has been helping clients grow, protect and preserve the wealth they have worked so hard to achieve. By developing a deep understanding of what his clients hope to accomplish with their wealth, Shawn is able to create and implement customized strategies that help them address their concerns, achieve their goals and adjust as needed as their life evolves or priorities change. 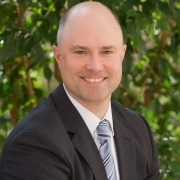 As a Certified Financial Planner™ practitioner, Shawn believes in the importance of planning and upholds a code of ethics that prioritizes his client’s best interests. He also holds a Family Wealth Advisor designation, which reflects his demonstrated ability to work closely with families to understand their circumstances—not just their finances, but also their individual and collective goals and how they may impact one another. Shawn joined Morgan Stanley in 1995. Having spent his entire career at Morgan Stanley, he is well-positioned to navigate the firm and access whatever resources are required to help his clients pursue their personal and professional aspirations. Shawn earned his Bachelor of Business Administration in finance, economics and marketing from the Isenberg School of Management at the University of Massachusetts Amherst. Shawn lives in West Hartford, Connecticut, with his wife, two children and two Goldendoodles. He has been a member of the Estate and Business Planning Council of Hartford since 2009. When he’s not busy helping clients, Shawn enjoys golfing, traveling and skiing. 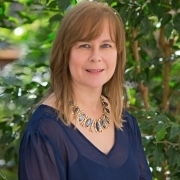 Barbara Taylor-Hatje has been helping clients address and achieve their lifestyle goals since 1999. Barbara’s goal is to clearly understand her client’s unique needs, as well as the opportunities they hope to create with their wealth. With her strong background in financial planning and insurance, Barbara combines her skills and experience with the resources of Morgan Stanley to assist clients in developing and implementing customized strategies that help them achieve and protect what matters most. Barbara began her career as a Financial Advisor at Morgan Stanley in 1999 and served as a Registered Client Service Associate at the firm from 2000-2006. She returned to Morgan Stanley in 2016 after working as a wealth consultant and financial advisor at other full-service financial consulting firms, where her practice focused on helping successful women make smart decisions about their financial futures. Barbara received her Associate of Science degree from Mount Ida College. She earned her Certificate in Fiduciary Governance from the Walker Center for Global Entrepreneurship at Thunderbird School of Global Management, and has completed the Certified Financial Planner™ classes at The American College of Financial Services. Barbara lives in Middletown, Connecticut, with her teenage son. 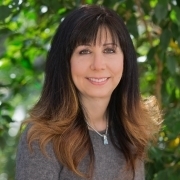 An active member of the community, she is a member of the Middlesex County Chamber of Commerce Board of Directors and chairs the Women’s Leadership Collaborative committee. Barbara also volunteers with the Middlesex Hospital Community Council. In her free time, she enjoys West Coast Swing dancing. With more than 10 years of experience in the financial services industry, Denise Woods focuses on delivering exceptional client service and ensuring that day to day operations run smoothly. With a combination of competency, efficiency and attentiveness, she helps ensure that our clients get the information they need as quickly and accurately as possible. Denise joined Morgan Stanley in 2006. She earned her Associates Degree in advertising and public relations from Johnson & Wales University. A native of Connecticut, Denise lives in New Britain with her husband and two children. She is deeply involved in her community, serving as a member of two parent teacher organizations, a Girl Scout leader, an active member of her church, and with New Britain High Schools Friends of Football, which provides support for the team through fundraisers, in addition to giving back to the community by hosting various drives. Denise is also a certified group exercise instructor. In her spare time, she enjoys traveling, going to the movies and discovering craft beers. Ready to start a conversation? Contact The McCormick Group today.